Shiromani Akali Dal (SAD) president Sukhbir Singh Badal today said the jailing of Shri Om Prakash Chautala had triggered a wave in favour of the INLD - SAD alliance in Haryana and now the combine was poised to surpass its Mission 60 Plus target and win 70 seats in the State.Addressing a mammoth gathering in favour of INLD candidate Buta Singh here, the SAD president said a massive sympathy wave had been unleashed in favour of the INLD after the court's decision to cancel Chautala Sahab's bail. "Till yesterday I felt we would manage around 60 seats, but now I am convinced we will win 70 seats. The people now want to avenge the injustice meted out to Chautala Sahab and that is the reason why i INLD will now sweep the State along with the SAD".Badal said the SAD would always remain steadfast in its support to Chautala Sahab and the INLD. "Gala Kataya ja sakda hai INLD de naal naata nahi todaya ja sakda".The SAD president also recounted how both chief minister Parkash Singh Badal and Ch. Om Prakash Chautala were men of words. Once any of these leaders makes a commitment you can consider it done. He said the innovative schemes and projects proposed by Chautala Sahab including increased pensions and unemployment doles would usher in an era of social security in Haryana. Referring to Hooda, the SAD president said the Congress chief minister had spent Rs 200 crore on a false propaganda called "Haryana No. 1". He said the same amount could have been spent in villages to improve the lot of roads and drains. "However Hooda Sahab was never interested in development as his one and only priority was to keep the Gandhi family happy. He even became a property agent and stooge of Congress president Sonia Gandhi's son in law Robert Vadra", he added.Stressing that only the INLD- SAD alliance with its direct connect with the people could provide all round development, Mr Badal urged the people to choose a government which would work for their development.Earlier INLD candidate Buta Singh gave an inspiring and emotional speech recounting the atrocities inflicted on Chautala Sahab by the Hooda and UPA government. 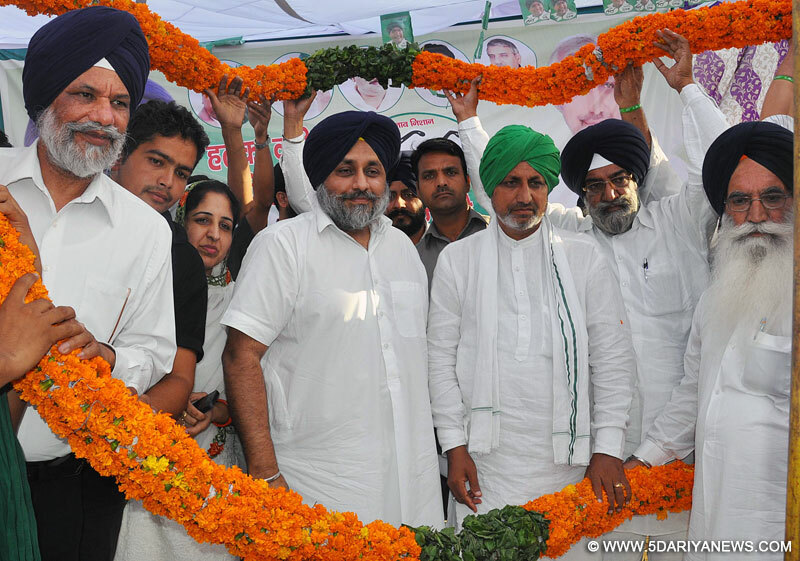 "A majority on October 15 is the key which will open the jail doors for Chautala Sahab", he added. Senior SAD leader and minister Surjit Singh Rakhra also spoke on the occasion.